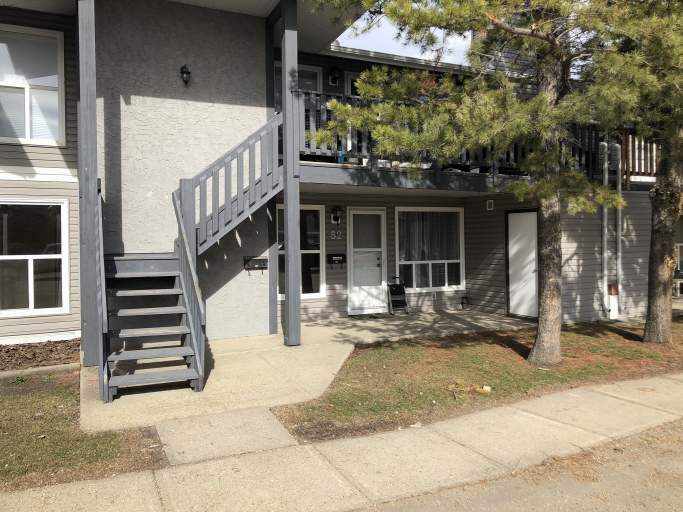 Located in southeast Edmonton's Crawford Plains community, this spacious and bright ground level carriage style condo is sure to impress! Just blocks from the Anthony Henday Ring Road, Millwoods Town Centre, and the Grey Nuns Hospital, the location is amazing! Plus, parks and schools including T.D. Baker Junior High School, dot the area, making this unit perfect for small family too. Inside the unit you will be greeted with laminate flooring and bright windows that fill the entire unit with natural light! A large living room with a wood burning fireplace transitions smoothly into a large dining area with an overhead ceiling fan, making a perfect space for entertaining guests or even just plain relaxing! The kitchen offers stylish white cabinetry contrasted with dark countertops that provide enough space to make anyone jealous! A full size fridge, stove and dishwasher, along with a huge pantry closet complete this functional kitchen. Down the hallway you'll find the large master bedroom with a huge walk through closet and its own private access to the updated bathroom with tub shower, along with an additional bedroom and a large laundry closet. One outdoor parking space is included in the rent.